Trigger Tom Taylor was the first apprehension of a named criminal suspect by Middletown Police Detective John Jones in the "Manhunter from Mars" comic strip. 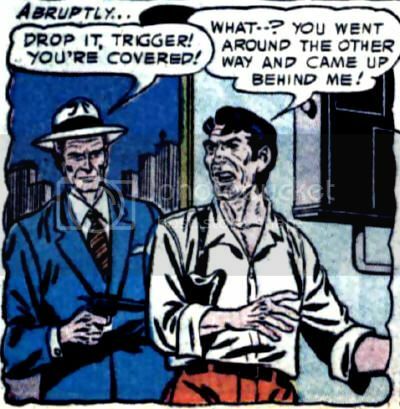 He was preceded by a gang of three unnamed hoods in the panels immediately before those that made up Taylor's first and only appearance in Detective Comics #226 (December, 1955). Taylor was shown firing a revolver down a rooftop staircase at Jones, who was pressed against a wall around a corner. Jones turned invisible, walked up the stairs, and reappeared with his service pistol planted into the small of Taylor's back. Quote: "Come and get me-- if you think you can!"